I have been getting back into the groove of things and catching up on sleep and work because I was out of the office, out of town and out of the East Coast this past weekend. Yep, that's right, I went to visit T.J. and I finally got to see where we're going to be living for the next few years. I got to see new our house, our new neighborhood, our new home for the very first time! To say I was excited is an understatement. The days before I left dragged but finally I was skipping out of work at noon on Thursday and heading to the airport. This was the longest flight I've been on in a while, made doubly long by the fact that my anticipation was at the extreme. I had never been to the West Coast before, and even though T.J. does his best to tell me all about it on the phone, I really had no idea what to expect. When we finally started to make our descent I'm sure I was annoying my neighbor in the window seat as I tried to crane my neck for a glimpse of Washington, my future home. T.J. and I excitedly embraced in the airport and any worry I had about being too tired due to jetlag went out the window. I seriously felt like I'd landed in a foreign country and needed a passport to be there. Everything was so unseen and new for me. We hopped into T.J.'s car with Washington tags and headed down the road. Our house (love typing that) is about 45 minutes from the airport. Along the way T.J. pointed out sights, much like I imagine one day I'll do for visiting family and friends. Soon enough we were driving past the army base which meant we were almost there! We live in a town that is basically an extension of post. We're not technically on base, but T.J.'s commute is 10 minutes door to door and everyone who lives in our town is military or retired military. I love that it's a safe neighborhood, especially since T.J. will have late hours and overnight shifts at the hospital and I will be home alone a lot. We finally pulled into the driveway and I could hardly contain myself. After months of stalking the listing pictures online I finally got to see our house in person. I walked in a giddy haze through our basically empty home save for a futon, some weights strategically placed in the center of the floor, T.J.'s dresser, and a bed with no frame. But it is fantastic! I LOVE IT! I can see us living there together and my excitement for this new adventure quadrupled as I explored each room of the house. Now I promise to post so many more details about the house but... this post is already so long and we are only just in the first hour of my visit. So after the initial tour, I needed to be fed (since it was basically 10pm my time and I'd had neither lunch nor dinner). We drove just a few minutes down the road to the little shopping center and town square. We grabbed some Italian food and I sucked down a few diet cokes so I could stay up a little later. But no such luck... I was basically loopy by the time we got home from all the excitement and weird hours. It was an early bedtime but I was excited for the next day. T.J. got up early for work on Friday and subsequently I got up early too. While he was out I took a shower for the first time in the bathroom (can't wait to finally have a bath tub again), fixed myself a little breakfast in the kitchen that I will one day fix all my meals in, and called my parents to fill them in on all the details before T.J. came home to meet me. Once he was home we set out to explore. We headed out our front door and continued down the sidewalk and then out of the neighborhood and into the woods. One of my new favorite things is how many trails there are in our little area, and this particular one we headed down is the prettiest ever! 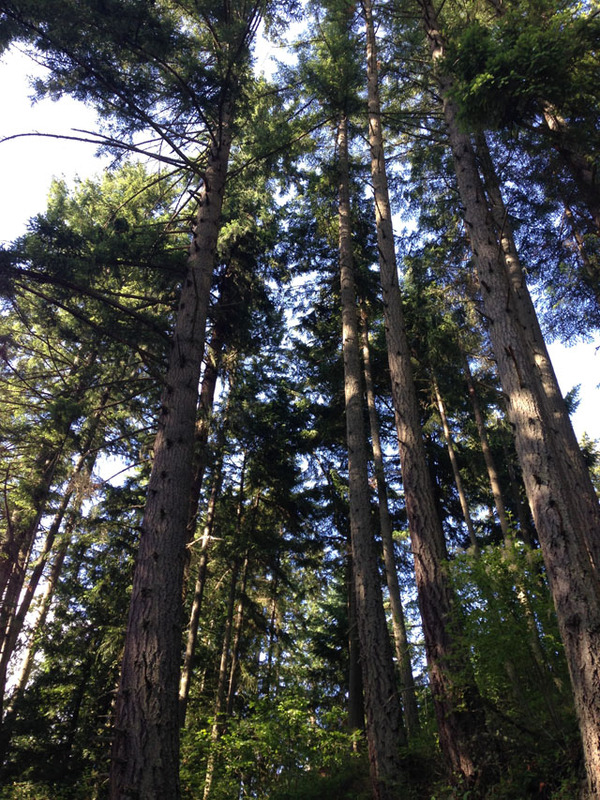 I immediately understood why they call it the Evergreen State. 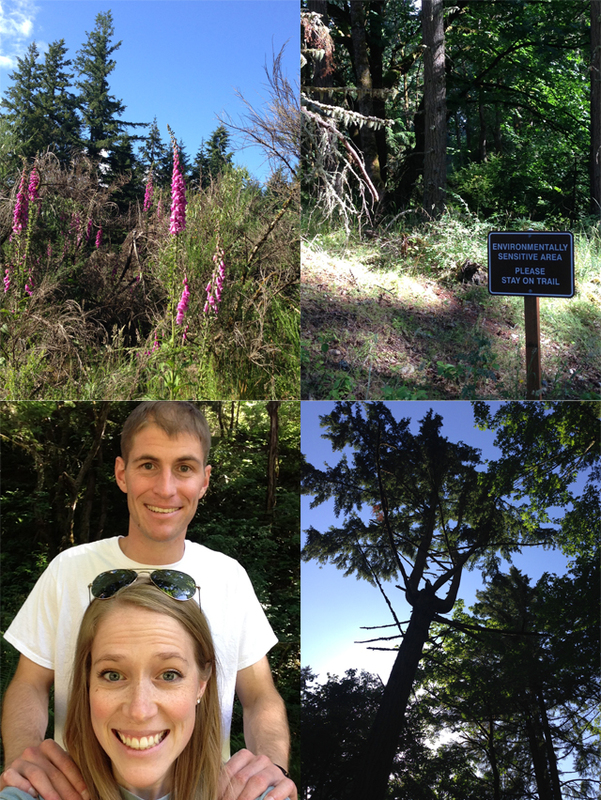 The tall tall trees, the carpet of ferns and moss, we both kept exclaiming that it felt like we were in Jurassic Park. We walked for about a mile down a trail following the sound of a stream nearby that T.J. kept trying to convince me ended at a beach. But in the dense forest I was having a hard time believing him. Soon the trees started to thin and before us was an old railroad tunnel with bright sun pouring through. 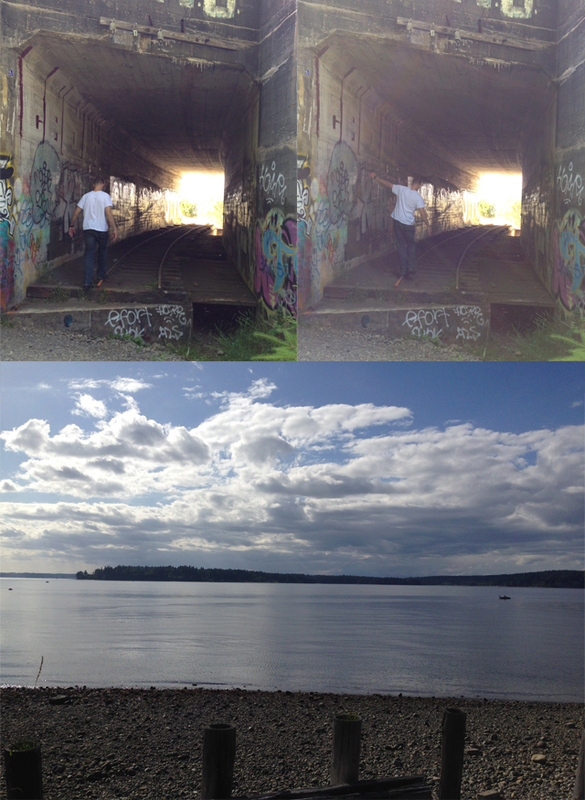 And on the other side of the tunnel was indeed a beach. A beautiful pebbly beach and the Puget Sound splayed out in front of me. We skipped rocks and soaked in the (supposedly rare, but I don't want to believe it) sunshine and took a beat on the old rail road ties. I also dipped my feet in the cool refreshing water, the further West I've ever been. I can't believe I get to live here!! We headed back to the house to clean up and and then T.J. took me out to dinner. We dined al fresco by the water and I just can't get enough of the view! 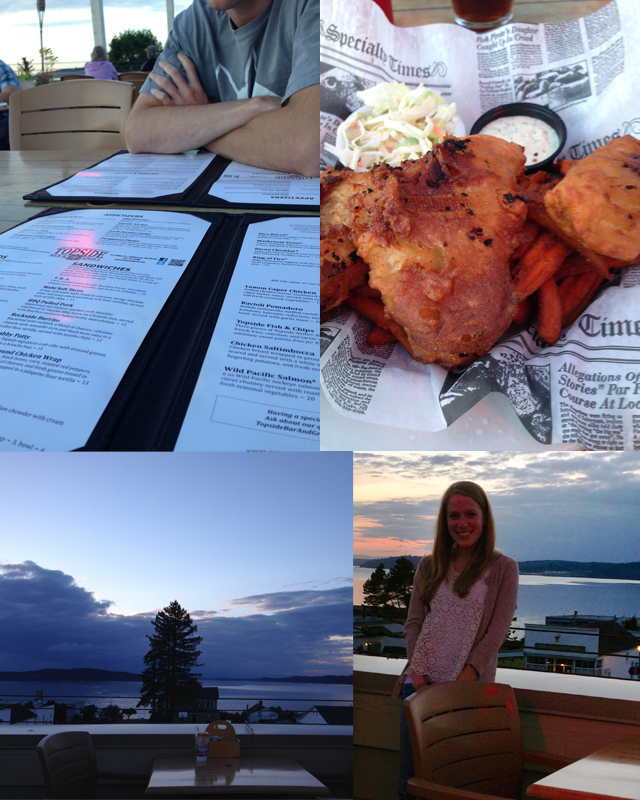 I had yummy fish and chips and T.J. had a burger and we enjoyed the sun staying up past 9pm. We came home fully worn out from our full day of exploring our corner of the Northwest that it didn't take much to convince T.J. that watching Frozen on the floor was a good idea. And that's where I'm going to end this longest post ever. Guess I'll have to break down my recap more. I promise the next post wont be just about 1 day and it wont be this long, well... at least I promise to try! All so exciting! And I love that you watched Frozen....the boys want to know....whatdya think? The house looks great from the outside, and how great that those trails are nearly at your door! Looking forward to your next post! When I first got married my hubby took a job in northern California (Redding) and I was still in Norfolk, VA finishing up my job, preparing the move, etc. I remember those LONG flights from east coast to west coast - I could really relate reading about your flight! It's an exciting time tho - exploring a new place together, getting your house ready together, etc. I remember that I felt going somewhere "foreign" together made us unified as it was us against the world. Enjoy the time!! Told you would love like I do. Wait till you head up the mountain and start walking.